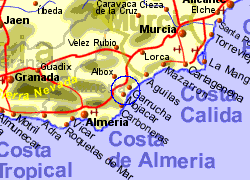 The old town of Vera lies approximately 6Km inland from the Costa de Almeria but a large area of this coastline between Garrucha and Villaricos is often described as Vera. Vera town itself can often be missed by tourists on the coast who believe they have visted Vera. The town, which has an attractive old part dating from the 16th century, has a number of notable buildings, including the relatively modern 19th century bullring. 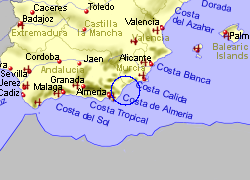 By the coast there are a number of modern low rise developments and hotels, including the nudist Vera Playa Club Hotel. Nearby is the only water park in the area. 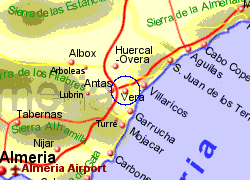 Map of the Vera area.